Тема wordpress для блога от ThemeForest Filthy представлена в двух цветовых схемах: Коричневая и Черная. 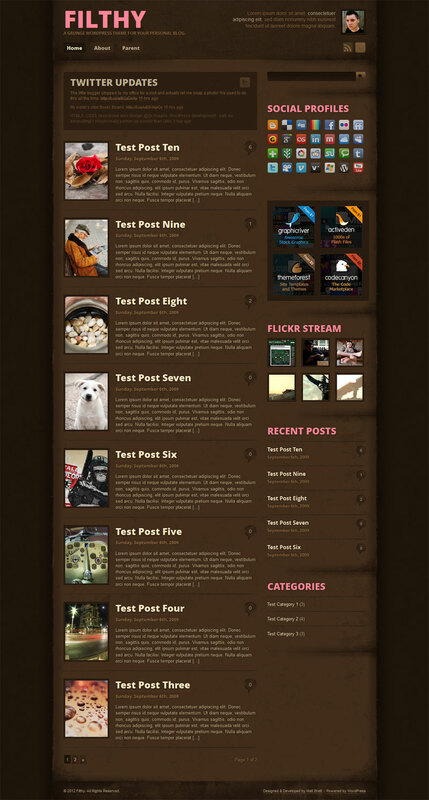 WordPress menu for the main navigation. Standard featured images (post thumbnails), with fall-back custom field method for images. 2 full colour schemes – brown and black. User specified “accent” colour can be chosen from a colour picker in WP-Admin for easy customization. Super hot CSS3 goodness supported by most modern browsers. Embedded fonts used for headings and the logo give this theme a unique feel. Degrades gracefully in browsers that don’t support these frills. Unique article/comment toggle saves vertical space and is just plain awesome. This can be disabled via the Theme Settings panel if you prefer the more traditional approach of having comments below the article. Custom built theme settings panel within WP-Admin that allows you to customize the theme without editing any templates. Flexible logo space allows images up to 890px wide and any height. Image path and dimensions are entered in WP-Admin. Easily link to social networks you take part in, with support for 28 of the most popular sites. Widgetized sidebar with a handful of custom built widgets. Custom widgets for ad spots (4 125×125 buttons, 300×250 bigbox). 728×90 leaderboard is also supported – sits above logo. Super lean markup and CSS , makes advanced customization a pleasure. Tested on Windows and Mac. Looks great in all modern browsers. Some details are toned down for older versions of IE, but nothing is broken. Support for Twitter Tools, FlickrRSS, WP-PageNavi, and Subscribe to Comments plugins out of the box.